Join our VIP Club and receive an immediate 10% discount off your purchase! Free shipping within the lower 48 states is always included with every order! 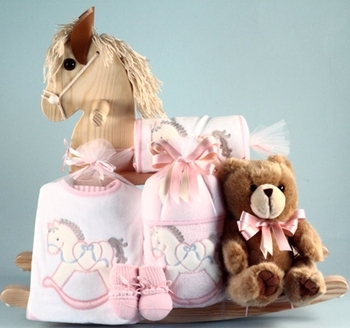 This cute baby girl gift set centers around an adorable wooden rocking pony for hours of imaginative play! The little pony rocker is all wood and custom made with a clear finish to go well with any d�cor. The wooden pony is sturdy, safe and perfectly sized at 25 inches long by 10 inches wide, standing two feet tall. Complete with a yarn mane, rope bridle, soft ears and wooden handles, the pony will surely become a treasured toy and friend! You also have 2 options for personalizing this gift! The 1st option is to have the baby�s name embroidered onto the teddy bear�s tee shirt. Please click on More Images to see the teddy bear personalized. The 2nd option is to have the rocking horse personalized with the baby's name. Of course, you can choose to have both personalized for an extra-special keepsake gift. Along with the rocker, we also add some baby essentials and a teddy bear. Each 100% cotton layette item comes adorned with a matching rocking horse appliqu� and all are made right here in the USA with unsurpassed quality and premium fabric. It�s a wonderful way to welcome the new girl home and is also quite an impressive shower present. Once finished, the entire set is wrapped in clear tulle for a lovely presentation. *Rocker conforms to all US Consumer Product Safety Testing and adult supervision is recommended for children under 3 years of age. Processing Time Non Personalized: 2-3 business days. Does not include shipping time. Processing time does not include shipping time. Please select the appropriate shipping method and provide your event date during checkout to ensure your products arrive on time.